Do you think English is a hard language to learn? If so, you’re not alone. English students all over the world are lamenting at the difficulty of the English language, with its irregular verb tenses and spelling that doesn’t seem to follow a logical pattern. But is it really as difficult as it seems? There is strong evidence to support the claim that English is a difficult language to learn. English has a crazy spelling system and it seems like every word makes up its own pronunciation rules, because English has borrowed so many words from other languages. In order to know how to read the spelling you have to know which language it comes from or have previously heard the correct pronunciation. Irregular verbs in English are seemingly complex and are often a headache for English language learners. Why is the past tense of “buy” “bought”, and why is the past tense of “sell” “sold.” Why aren’t “buyed” nor “selled” real words? In English, questions are made by changing the order of the words, something that doesn’t exist in other languages like Portuguese. Many Brazilians will say “You are American?” instead of the correct “Are you American?” Word order is not only important when asking questions, but when describing nouns as well. English has very subtle word ordering rules that make “A cute little brown dog” correct to say, whereas “A brown cute little dog” would be incorrect. Despite these difficulties, English is actually the easiest language in the world to learn. You may think I’m crazy for saying this but allow me to explain. 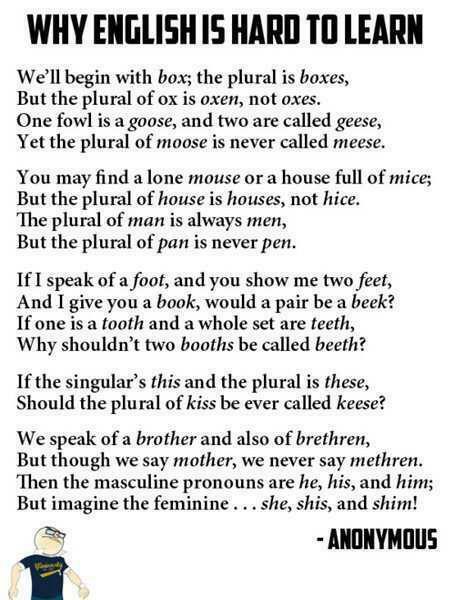 Unlike other languages, English has no cases, no gender, no word agreement, and arguably has a simple grammar system. English speakers sometimes have difficulties when learning Portuguese because they are not used to words having genders. The reason why English is the easiest language to learn is because of the vast selection of English resources to learn from, including TV shows, movies, music, podcasts, books and websites. English is the most studied foreign language in the world and there are a ton of resources available to help speakers of each specific language learn English. There are thousands, perhaps hundreds of thousands of books written about learning English as a foreign language that you can use to improve. In addition there are a ton of great English learning blogs on theinternet. Studying from a book will only get you so far though; you need to get contact to the real language as it’s spoken by native speakers in order to speak the best English. You need to make a lifestyle out of English where you listen to music, watch TV and read in English every day. The popularity of English pop culture means that you don’t have to look very far in order to find English language resources that you can incorporate into your daily life. English will seem easy for you when you stop looking at it as something mechanical and start connecting to the culture that it comes from. You need to connect to the language on a deeper level by absorbing media produced in English. There are hundreds of TV shows in English that you can watch for free online to help improve your language abilities. Watching an episode of the TV show Friends every day can drastically improve your English, and it will help you understand the culture that comes with the language. No other language can boast so many different types of TV shows that guarantee there will be something that everyone will enjoy. I’ve found it difficult to find good TV shows to learn Portuguese with, since most TV shows in Brazil are novelas. If you know of a good Brazilian TV show, please let me know in the comments. Truth be told, it is pointless to ask whether English is a difficult language or an easy language to learn. If you want to believe that English is a difficult language then you will find reasons to justify your belief that it is hard to learn. But if you believe that it is easy to learn then you will find reasons to justify that belief. What is most important to ask is if you are willing to devote yourself to the process of learning a language, which means having daily contact with the language and incorporating it into your lifestyle. Anything that is seemingly difficult can be accomplished if you consistently apply yourself to it and are committed to the end result. NASA didn’t bother asking whether it was difficult to put a man on the moon, they asked whether it is possible and found ways to make it happen. Language learning is not a destination with a clear path to follow, it is a journey that will lead you down many different paths. There are many paths to fluency but what they all have in common is that YOU are the one who has to walk down them. YOU are the one who sets your pace; YOU are the one who is responsible at the end of the day for failure or success. 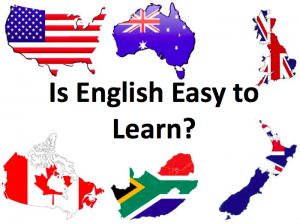 Do you think English is an easy language to learn? How do you approach learning a new language? English is all but an easy language to learn. If you look for an easy language, try Esperanto – after one year of learning it your language skills will be much superior to those acquired after ten years of learning English. Ypur tips and posts are very good to improve our knowlegments, thanks a lot. very interesting article! Thanks for sharing your experience with us..
what is the full name of the author,.,?? Pourquoi ? It’s really fun, it took me a year to learn. Hello there! Well, from my point of view I think English is not a difficult language to learn. Even though it has a crazy spelling system and many words from others languages with some strange sounds and difficult to know which is which there are many reasons that make English an easy language to learn. as you said it above you can find material and people willing to help and exchange languages everywhere on medIa, so that’s why I think English is one of the most easiest languages to learn. I’ll always find this articles useful, thank you for teaching us and greetings from Colombia. Hello This is a really good article for me English is one of the easiest languages to learn because it is very simple and has common words with many Latin languages but the real difficulty for me is that in Algeria we do not study English and instead are taught in French as compulsory foreign language. maybe in other languages you can do this too? but in English if you say buyed instead of bought. we all know what you mean. and you will be ok. Proper English Grammar doesn’t exist in the real world. If we all wrote exactly the way we speak, there’d be no more confusing grammar. and all of these words that are required to be learned memorized, they would fade away into oblivion like their ancestors. and we would be left with an even easier language than our predecessors. As an american, I found english extremely easy to learn, being exposed to it all my life. I think basic English is very easy to learn and its lack of complexity explains why so few English people learn foreign languages (which have the elements you mentioned in your article). As a native English speaker, English is arguably the hardest language for a non-native speaker to learn. Just as a native English speaker would struggle with languages like Mandarin Chinese, native Mandarin speakers struggle with learning English. It’s a matter of perspective that allows you to make the final verdict of whether or not to learn English. How Joined the word for English? it is very broken but understandable. study more, you are on the right track!